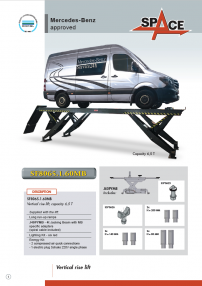 We are really proud and pleased to inform you of the recently obtained approval by Mercedes for our SF8065.1.60MB vertical rise platform lift. After a thorough metrological and field-testing process, the SF8065.1.60MB series in special Mercedes configuration / livery have been approved and is now available in production! More details are available in the attached product sheet. Feel free to contact us for any price proposal and technical clarification.